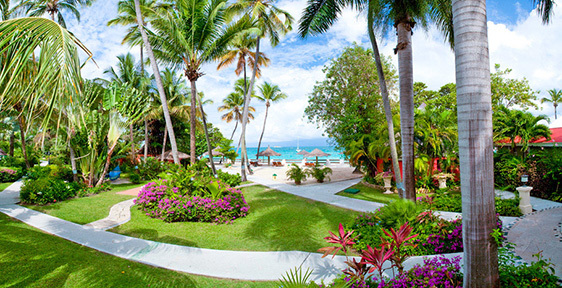 Sandals Grande Antigua Resort & Spa is located on a twenty-seven (27) acre site situated on the island's most beautiful beach, Dickenson Bay. It is only 15 minutes from V. C. Bird International Airport and 10 minutes from Antigua's capital, St. John's. Explore the Caribbean Grove, a charming seaside garden oasis graced by meandering pathways, majestic palms and cooling Trade winds. Then step into a realm of chic sophistication where European grandeur unfolds from the hillside to villas-by-the-sea at the Six-Star, all-suite Mediterranean Village. Come relax on silky-soft, pure white sands and let the warmth of the Caribbean fill your senses. Create your own lover's legend as you share the most romantic holiday of a lifetime. Two perfect worlds. One grand resort. All included. 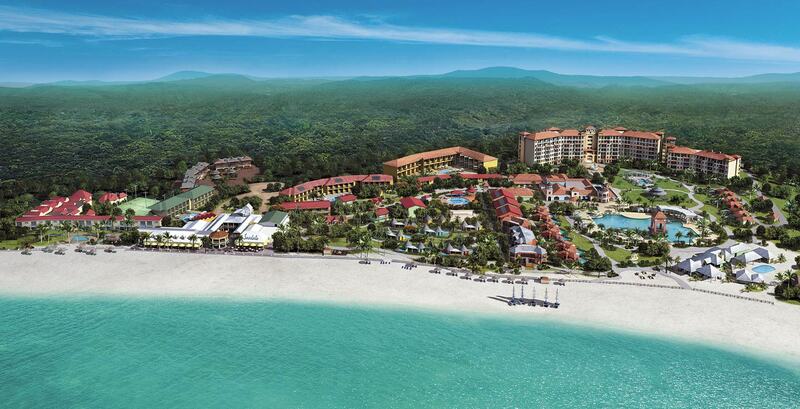 Voted Sandals Grande Antigua “World's Leading Honeymoon Resort” 2 years in a row. Voted Sandals Grande Antigua “Caribbean's Leading Honeymoon Resort” for the 4th consecutive year. Voted Sandals Grande Antigua “Antigua & Barbuda's Leading Resort” 3rd consecutive year/4th time overall. 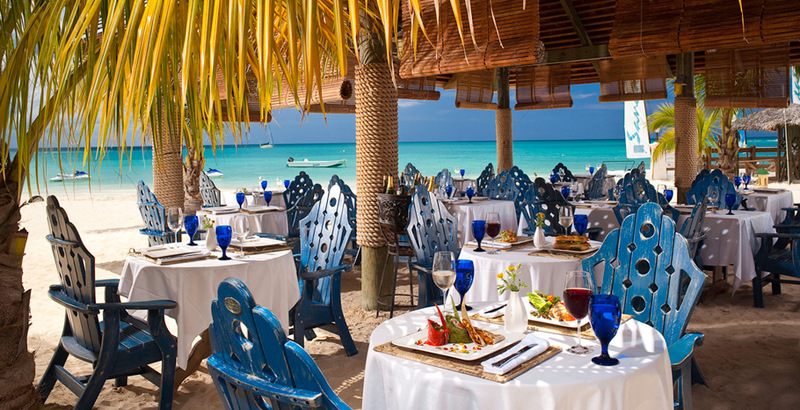 Voted Sandals Grande Antigua Resort “World's Most Romantic Resort” 15 Years Overall. 6 Star Diamond Award for the Mediterranean Village, American Academy of Hospitality Sciences. 5 Star Diamond Resort, the American Academy of Hospitality Sciences. For the ultimate in privacy, space and indulgent exclusivity, escape to the exotic luxury of a tropical villa, complete with decadent plunge pool and whirlpool hidden within its own private garden. Nestled along either side of the Mediterranean Village Pool just a short stroll to the beach, each boasts the services of a dedicated butler to handle every aspect of your stay with discretion and anticipatory grace. A spacious living room designed with classic island furnishings and porcelain-tiled floors opens onto the private pool patio, as does the lavishly appointed bedroom with its bamboo blinds and ornate mahogany four-poster bed. The luxurious bath features double sinks, a Roman whirlpool tub and a separate walk-in rain shower. This experience is enhanced with 24-hour room service. It is total romantic seclusion at its absolute finest. Exotic, private and endlessly romantic-with the discreet services of an experienced butler trained by the Royal Guild of English Butlers-these decadent suites-in the-round offer unparalleled levels of privacy with the ultimate indulgence: a private plunge pool completely shrouded in its own sultry gardens. Located amidst the tropical foliage of the Caribbean Grove just steps from the beach, each Honeymoon Garden Rondoval boasts a soaring 20-foot conical ceiling crowning an enclave of modernity within. Accentuated by cool stone flooring with decorative cut stone trim, rich mahogany furnishings, marble bath and plush fabrics. This experience is enhanced with 24-hour room service. With commanding views of the Mediterranean Village Pool, manicured tropical gardens, glistening beach and the world-famous Dickenson Bay, these fabulous penthouse suites are the pinnacle of fine living on the top floors of the Cypress tower. Your personal Butler has a dedicated formal pantry with wet bar adjacent to the suite's formal entry which is lined in decorative mosaic tiles and framed in richly carved woods. Enter the spacious living room, appointed with elegant island furnishings, porcelain tile floor, white walls and wood crown moldings. A large, spacious balcony, complete with dining table and two chaise lounges, is accessed from both the living room and bedroom. The marble bath features double sinks, a Roman whirlpool tub and a separate walk-in rain shower. Here is a place where every care melts into the sea and every whim is catered to with gracious hospitality. At eleven world-class restaurants, a global team of master chefs caters to your endless culinary cravings. From the fiery island dishes of Eleanors and the stir-fry drama of an Emperor's Feast, to the heart-warming Italian cuisine of Mario's, passions of the palate are served to absolute perfection. And whether you like it spicy, tangy, zesty or sweet... in stunning settings that are on-the-beach casual or white-gloved chic, Sandals Grande Antigua has your mood-of-the-moment covered. Dress Code: Resort Casual Attire. However, bare feet are permitted. Colombian Emeralds International, a leader in luxury travel retail for 35 years, offers an award-winning customer service experience, along with the finest jewelry and watches at Tax and Duty Free prices, across the most desired destinations in the world. The ideal pathway to mind-body rejuvenation begins at the Red Lane® Spa. Loosen up with our West Indian massage, or try body exfoliation with pure island sand. Reserve a massage on the beach or in the privacy of your room. Relax with a mud mask, unwind with a margarita and manicure at our spa boutique or do an entire beauty makeover. It's all about you and it's about time-now that you have it. *Spa services are additional. LifeFitness® treadmills, exercise bikes, elliptical trainers, step machines, and weights span across two air-conditioned rooms. If you want to work out outdoors, look for yoga classes beside the Reflection Pool or sign up for water aerobics at the Caribbean Village's pool bar.